Japanese para glider pilots dominated the opening event of the Pre World International Para Gliding championship which started at Billing yesterday. The National Hydroelectric Power Corporation has put the first generating unit of 100 MW on the 300-MW Chamera hydel project (stage-II) on the Ravi into commercial operation. Thakur Kaul Singh, Parliamentary Affairs and IPH Minister, yesterday said Rs 60-crore German-aided irrigation project would be launched in the state soon. The German Government had agreed to release the amount, he said. The Manali-Sarchu road will remain closed to vehicular traffic from November 1 2003 till the middle of May 2004. This was stated in a press release today by the Commanding Officer, 38 GREF, RTF. 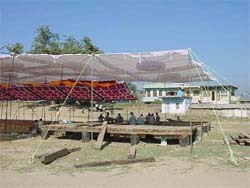 Preparations are on for the three-days Hamir Utsav starting from November 1, at the local Boys School Ground. Preparations are on for the Hamir Utsav starting from November 1. — Tribune photo by Chander Shekhar Sharma. The members of the local District Bar Association today called off their strike on the intervention of Mr V.K. Gupta, District and Sessions Judge, Chamba. James Frank and Breathnack Staina, the alleged killers of Anna Hamilton, a British national were produced in the court of Rajeev Sood, Judicial Magistrate (First Class) Manali, today by the local police for further remand. As many as six robbers, armed with sticks and sharp-edged weapons, attacked members of family of martyr Ramesh Chand, who had laid down his life in the Kargil sector in Operation Vijay, at his native village Jeora in Harrotta gram panchayat under the jurisdiction of Nurpur police station on Monday. The Jwali police has arrested Ramesh Chand of Batt village for allegedly attacking his wife Ashok Kumari with a sharp-edged weapon and injuring her. A case under Section 307 of the IPC has been registered against him. Ashok Kumari has been admitted to hospital. Seven members of the Himalayan Hiker Group, Durgapur, West Bengal, have scaled the 5,298 metre high Hanuman Tibba peak. Shorohove Nikole was declared first in the men’s event of race to goal to Jogindernagar. He covered a distance of 63.1 km to claim the event. The 1992 world record holder for the longest para glider flight of 120.9 km from Billing Mr Xavier stood second. Debu Chaudhary from Manali was third while Eddle from India was placed fourth. Ms Hiraki Keyoke was first in the same event for women, Ainja Roal of Germany was second. Ms. Louis Barnhum stood third. On the second day of the competition, in the 74 km cross-country race 25 participants took part. According to the organisation committee all para-glider pilots had landed safety and the results of the event would be available late at night. The competition started yesterday without a formal inauguration. The Revenue Minister, Mr Brij Behari Lal Butail, was present at the site at the last moment. A havan was organised at Billing in the morning in which Mr Butail, the Baijnath MLA, Mr Sudhir Sharma, the Commissioner Tourism, Ms Upma Chaudhary, other officials and participants took part. The pilots were flagged off one by one from the site of takeoff. A discordant note was struck when some local paraglider pilots boycotted the event and staged their own show by organising a takeoff from another hilltop at Billing. They also complained to the Revenue Minister about the “stepmotherly” treatment meted to local pilots. Ms Chaudhary, in charge of the event, brushed aside the complaints and said that best possible arrangements had been made keeping in view the difficult site. She said there were no sponsors and funds had been provided by the state government and the Tourism Department for the event. The National Hydroelectric Power Corporation (NHPC) has put the first generating unit of 100 MW on the 300-MW Chamera hydel project (stage-II) on the Ravi into commercial operation. The testing on the second and third units of 100 MW each is in process. In a press note here yesterday Mr Yogendra Prasad, Chairman of the NHPC, said the 300 MW Chamera project with three generating units of 100 MW each had been constructed at an estimated cost of about Rs 1700 crore. He claimed that the project was a benchmark in the history of power generation in the country, by being ahead of schedule by a year. He said the Union Minister of State for Power, Mrs Jayawanti Mehta, had inaugurated the construction works by conducting the first blast on the inlet adit tunnel of the project on November 15, 1999, and yesterday the project had been put into generation. Work on the project had been executed on a contract basis through a joint venture of the Indo-Canadian Hydro Consortium SNC Lavalin Inc., SNC, Lavalin Acres Transnational, Canada and GE, Canada. The project comprised major works such as 39-metre concrete gravity dam at Bagga, 8-km-long headrace tunnel, 3.5-km tailrace tunnel, and an underground powerhouse near the Jarangla nullah. Mr Prasad said a Rs 11 crore catchment area treatment plan sanctioned by the NHPC for this project had been implemented and was yielding good results. The minister, who was speaking at Bhangrotu after inaugurating a four-day district sports meet of schools, said the state government would spend Rs 253 crore on drinking water supplies, irrigation, sewerage systems and flood control works during the current financial year. Of this, Rs 40 crore would be spent in the Mandi district. He said 30,000 houses were being constructed by the government under the Rajiv Gandhi Awas Yojna for the IRD families this year. The SP Kulu and Keylong, Subdivisional Magistrates of Manali, Pangi and Keylong have been informed about the decision the released added. Preparations are on for the three-days Hamir Utsav starting from November 1, at the local Boys School Ground. The HP Chief Minister, Virbhadra Singh, will be the chief guest on the inaugural day. He will offer puja at the local Shiva temple before declaring the festival open. Mr Ram Lal Thakur, HP Industries Minister, will be the chief guest on concluding day function. Mr K.D.Lakhanpal, ADM, Hamirpur, told this reporter here this evening that the installation of pandals and the stage for Utsav was in the final stage. He said that beautiful cultural performances would be presented during the utsav. A state-level kabaddi contest for men and women would also be organised and prizes given to the winners. The lawyers had been on strike on October 23, 24 and 28 in connection with the alleged beating up of a lawyer by some policemen on the night of October 22. Meanwhile, the president of the association, Mr K.K. Gupta, said a criminal complaint against the policemen involved in the incident had been filed by the aggrieved lawyer in a local court. The court remanded them to judicial lock up till November 11. According to information, two masked robbers first attacked Kaushalya Devi and Pawan Kumar, mother and brother, respectively of Ramesh Chand who were sleeping in the verandah, they, then, entered the room where his second brother Ashok, his wife Shakuntla and their two-year-old son Adhitya were sleeping and beat them up. The robbers locked the family in a room and looted jewellery worth Rs 40,000 and Rs 10,000. In another incident at Daroh 45 kilometres from here, Raj Kumar was injured when his motor cycle was hit by a jeep. Raj Kumar was admitted to Civil Hospital, Palampur. A case against the driver of the jeep has been registered. The team consisted of Parichit Nath (group leader), Chintu, Shubham Ganguli, Dev Dutt, Nesu Ram, Geeta Thakur and Krishna Thakur.